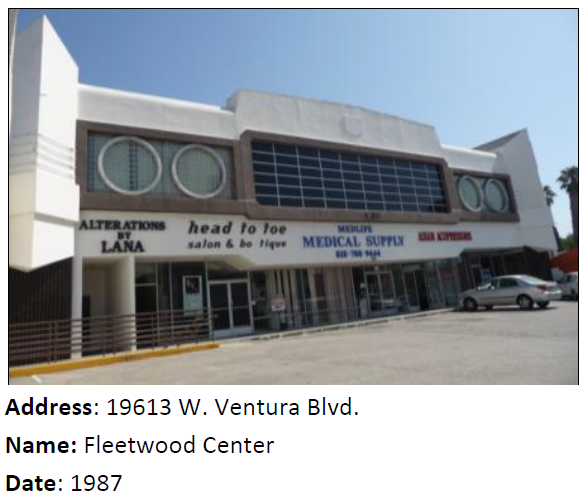 The Fleetwood Center is such a great example of Programmatic architecture that SurveyLA documented it even though it’s post-1980! The eastward trek across the southern San Fernando Valley continues! 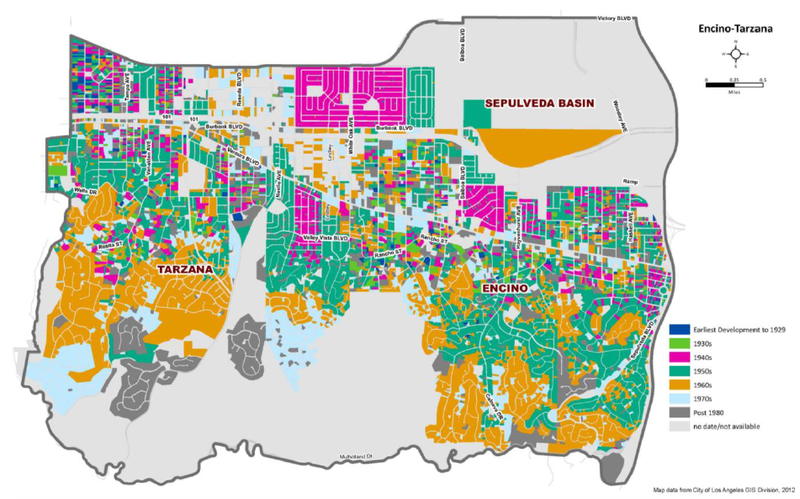 Last time I took a look at SurveyLA’s findings for Canoga Park – Winnetka – Woodland Hills – West Hills, and this time I’ll be delving into the Encino – Tarzana Community Plan Area. Long before strip malls designed to look like Cadillacs were ever built, the area was part of Mission San Fernando. In fact, present day Ventura Blvd. roughly follows the path of El Camino Real, the famous mission-linking road used by the Spanish missionaries. By the mid-19th Century much of the mission lands had been divided into ranchos and the survey area was part of Rancho El Encino. Los Encinos State Historic Park still remains, giving the public a rare glimpse into the rancho era. It is one of only a handful of historic resources in the area that have been officially designated to date. The agricultural character of Encino and Tarzana wasn’t seriously challenged until after World War II. However, there was an earlier wave of development that runs from the early 1910s, when developers were eager to capitalize on the completion of the Owens Valley Aqueduct (1913) and the annexation of the area to the City of Los Angeles (1915). Like other parts of the south San Fernando Valley, the Los Angeles Suburban Homes Company was an important early developer and had links to the Los Angeles Times. Times publisher Harrison Gray Otis sold off some of his land to a man who also knew a thing or two about publishing: Edgar Rice Burroughs, creator of characters like Tarzan and John Carter. Showing a knack for product placement, Burroughs became a developer and named his community Tarzana. Burrough’s books have also made their way into films, as recently as 2012. The 1920s saw a number of road projects that made the area more marketable for residential use including the construction of the Sepulveda tunnel and the paving of Ventura Blvd. (it always floors me how recently some of these streets were first paved). The following map shows the decade of development for parcels in the Survey area. With a few exceptions, Encino and Tarzana are largely creatures of the late 1940s to the 60s. The film industry has definitely made its mark in the survey area. From 1929 to 1953 the RKO Studio Ranch churned out films, including some classics like It’s a Wonderful Life (1946). Many movie stars made their homes in the hills of Encino and Tarzana during their most productive periods (e.g. Clark Gable and John Wayne). While RKO was making movies, the Army Corps of Engineers was trying to prevent floods, especially after a bad one hit the San Fernando Valley in 1938. They went about this by channelizing the Los Angeles River, building Sepulveda Basin and Sepulveda Dam. This was critical to the area’s urbanization as people could now build right to the river’s edge without much fear of flood. 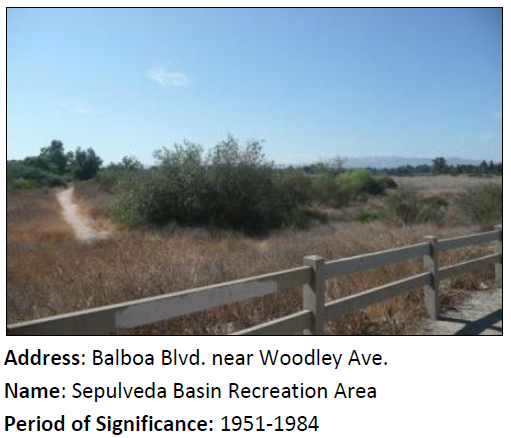 In the event of extreme rains the Sepulveda Basin can flood with relatively little harm and it serves as a recreation area and wildlife reserve at other times. It is currently the second largest park in the City of Los Angeles. After WWII, as GIs put down their arms and built up their families, the population of the area grew at a tremendous rate. In the early 1960s the 405 and the 101 freeways served as additional inducements to suburban development. Much of the residential architecture is Ranch or Mid-Century Modern in style. Famous architects are responsible for some of it, especially in the hilly southern areas. They include Ray Kappe, Richard Dorman, Richard and Dion Neutra, Daniel Saxon Palmer and Edward Fickett among others. Sadly, racially restrictive covenants operated to prohibit the sale of property to non-whites in most of the San Fernando Valley until the 1970s. However, according to demographic analysis in the City’s 1998 Community Plan for the Encino-Tarzana area, ethnic diversity has increased a bit since then (p. 12). Here’s a sampling of some of my favorite finds from the report (click to enlarge). Be sure to check out the report for yourself. It’s really a treasure trove. Also, if you have any comments on the report or historic place suggestions we’d love to hear from you. This American Colonial Revival house is one of the oldest in the survey area. It was actually built in 1884 and moved from the neighborhood now know as Koreatown to its current site in 1912! Liberace’s house during “The Liberace Show” years. This house combines elements of Ranch and Hollywood Regency style and has some unique interior touches such as a swimming pool shaped like a piano. During the Cold War, LA was outfitted with anti-air missiles that were on alert at sites such as this. 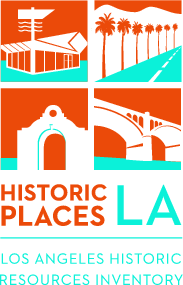 We got a tip about this site on MyHistoricLA.org! This Googie-style sign has outlived its bowling alley. Mid-Century Modern again, this time for a church. A Contemporary Custom Ranch house by a noted architect. A Mid-Century Modern house by second-generation architect Dion Neutra. This entry was posted in Uncategorized and tagged Encino, SurveyLA Reports, Tarzana. Bookmark the permalink.